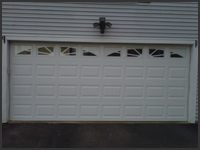 Professional garage door services at affordable prices. Carpentry work also available, call for details. Imagine coming home from a long day of work or picking the kids up from school or soccer practice. 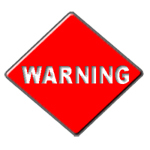 Like you've done a thousand times before, you pull into your driveway and hit the garage door opener. Suddenly, something goes terribly wrong. Unbeknownst to this homeowner, the torsion spring had broken on the garage door. Subsequently, her next attempt to open the garage door resulted in a mangled mess. 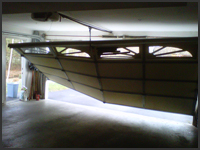 With one phone call to Lizzie's Garage Doors, a brand new garage door was installed in less than 48 hours. 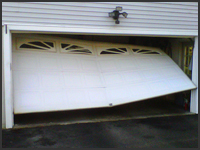 Protect your home and your family with a durable and reliable Clopay garage door. Lizzie's Garage Doors will help you find a quality garage door to fit your needs and your budget. Contact us today!